Seattle has over 90 unique neighborhoods. 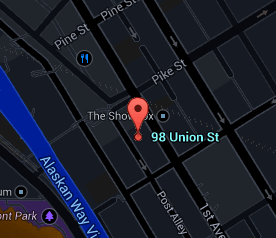 The location of 98 Union is in the area known as West Edge. Anchored on 1st Avenue and the southern terminus of Seattle's Pike Place Market, 98 Union sits in the heart of downtown. Seattle Art Museum, Benaroya Hall and the Post Alley are within walking distance from the building. Fine dining such as Vietnamese Cuisine Thoa's is located just at street level or for something a little more casual head up 1st Avenue to the Pike Brewing Company. Every building has its own personality and attributes. The community is an important aspect of city living and can have an impact on how integrated it is with the residences. The 98 Union building features can be explored here. A full list of amenities within the complex is displayed to help understand the offerings of the project. Built in 1985, Olson Kundig Architects completed a 260,000 square-foot, mixed-use condominium complex called 98 Union. Standing 12 stories tall with 79 luxury residential units, 98 Union boast generous floor plans and beautiful Puget Sound view for western facing units. Building feature include secure lobby, fitness center, club room and a beautiful terrace overlooking the Puget Sound. All active, contingent, pending, and sold listings for the 98 Union building. The Stroupe Group specializes in downtown Seattle condominiums. All the articles that have been published by the Stroupe Group concerning 98 Union and West Edge can be found here. Designed by Olson Sundberg Kundig Allen Architects, 98 Union is located near Pike Place Market on 1st Avenue.